A rich and light penetrating, non-oily under eye and neck cream that will tighten and reduce the appearance of fine lines, wrinkles and dark circles. Results vary but testing concludes 7 days for optimal results. 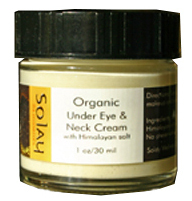 Hand made with Himalayan salt So-lay Water and Organic moisture cream proprietary blend. No preservatives, parabens or waxes used. Suitable for all skin types.